One of the highlights of President Obama’s State of the Union speech last night was a call for clean energy. The president put forth a goal: “by 2035, 80% of America’s electricity will come from clean energy sources.” “Clean energy” in this case means “wind and solar…nuclear, clean coal, and natural gas”. To me, that sounds a bit ambitious. Solar currently accounts for less than 1% of US electricity. The last new nuclear plant was built 15 years ago. And I’m not sure how clean “clean coal” really is. But it got me thinking about how Amish use energy. Amish do burn their share of fossil fuels–such as naphtha and diesel–to light their homes and power everything from washers to log saws. Batteries power buggy lights and handheld flashlights. Amish heat their homes with natural gas, propane, wood and coal. None of this sounds terribly clean. But some Amish do use solar panels. Solar fulfills a number of Amish energy needs. Solar cells recharge batteries, heat water, and power electric fences. I’ve heard Amish say that solar is not the best for everything. But some Amish have found it worth installing, which means it must be financially practical on some level. Not all Amish accept solar technology, however. For those that do, a number of shops cater to an Amish clientele. The Lighthouse in Holmes County, Ohio is worth mentioning. The Lighthouse carries an array of lamps for the home as well as solar panels. Lancaster County has at least a couple of solar dealers as well. Anyone have experience with solar power? As I understand it, solar panels are expensive up-front, but pay for themselves after a number of years. Are they worth it? And–what are the chances we’ll be living in an 80% clean-energy nation by 2035? 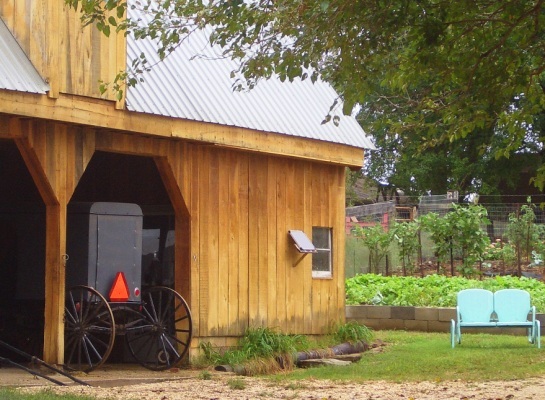 28 responses to Amish lead the way to a “clean energy” future? One interesting aspect (little known) about solar panels is that up until the late 90s it took more energy to create the panel than what the panel would produce in its lifetime. But the efficiency has been increased to the point where that is not true anymore, although I doubt that solar panels are (by the time installation costs, shipping, etc) really great energy savers. Hi Erik — Our friends in southern Michigan use small solar panels to charge their electric fences. Seems to me they use them for other purposes as well, for example, keeping a car battery fully charged to run small appliances. I’ll have to ask when I visit next month. As for 80% by 2035, I think that’s a politician’s over-reach with the hope of coming near the goal. Here it is 2011 already and I still don’t have the George Jetson flying car I was promised as a child! I just had an 8kW system installed last year. It works great in Arizona, where most power demand comes from air conditioning. When the demand is highest due to a hot sunny day, the supply of power from the sun is also high. And when supply is low due to the occasional cloudy day, demand is also low. There’s a natural balance. Right now it’s a niche product for experimenters and hobbyists (nobody cares if a hobby ever pays for itself), people who can exploit favorable (but unsustainable) tax policies, and people like the Amish who are willing to pay extra to live off the grid. I also watched most of Obama’s speech,missed some, was boring…fell asleep, but it sounds like just politician talk to me…..I really can’t see where he’s done that much….not for the SENIOR’S anyways….took (2) C.O.L.A.’S away from the seniors…..so I just hope the seniors rememeber that next election…..I for one most certainly will….. I saw where it said he wants to extend energy efficency and increase hospitals and health jobs in rural areas thet does not sound the best it means more trees chopped down and more socialist jobs spreading into the innocent tight knit communities.how do we oppose this? I’ve used solar panerls to recharge boat batteries, most sailors do now. A lot of farmers use them on the fence. If we go back to electric fence, that is what we will do. I am wondering about solar efficiency here in the Valley myself. Rather than looking for another source of electricity, I’m instead looking for ways to reduce our use. my fiance knows about it more then i do im still in window ac units for hot weather and wood burning stove and electrical heartes for winter,i myselp would like to become more interested and educated on solar panels,the cost,and maintance. There is a man here in Washington state that uses solar panels and the like to generate more than enough electricity and ends up selling it back to the power company. Sounds like a good deal if you can afford the panel installation in the first place. Our power company has some sort of program that would help with cost. My husband and I will probably include solar panels and a wind generator in our dream house plans. We want to be as far off the grid as possible. When I bought my last travel trailer about 15 years solar power was a big thing if you dry docked (parked your trailer where there was no electric hook-ups). You’d go to the big RV shows and they had it there. It was real expensive though. I never had it put on my trailer. Even in some of the RV books that I had it was in there. I haven’t been to an RV Show in a while so I don’t know if it is as popular now as it was then. Mike nice try, keep at it 🙂 Just double the efficiency, sounds so easy…As for the Amish I suppose the convenience/availability factor is one of the main motivations to use solar panels. Public electric is not acceptable but solar is (at least to some), so you use what is available to you. I don’t know how long panels last, but I guess once you get past the initial investment you have a basically free source of energy. But it’d be interesting to know more or less when that point is, and how it factors out after you include the other costs you mention. Lucy Chernobyl was a horrible disaster; I remember as a kid hearing how my Polish cousins were given iodine as the radioactive cloud approached Warsaw. Of course the ones that really suffered were plant workers, rescue crews and those in the immediate fallout area in Ukraine. However I don’t think safety standards at Chernobyl were anything near what we see in the West today. And if we’re talking emissions nuclear is among the cleanest. My dad was was a nuclear expert and the disaster at Chernobyl happened because the operator who was working that day saw the heat rising and overrode the fail safe. Had he just gone on his coffee break as he was supposed to, the accident would have never happened. Chernobyl and Three Mile Island often get mentioned in the same breath, though in their tangible effects at least they’re not really comparable. Chernobyl did kill dozens of people and could end up being the cause of thousands of deaths while Three Mile Island caused no deaths and was rated by the International Atomic Energy Agency at 1/100th the severity of Chernobyl. And Three Mile Island comes to mind now as I didn’t realize until my time at Elizabethtown College that Three Mile Island (ironically for this blog I suppose) is just a stone’s throw from Lancaster County–borders the county, in fact. That said I can imagine the prospect of a severe meltdown could have been terrifying at the time and left a deep impression on people. Since TMI was in 1979 and Chernobyl occurred mid-80s, I can also see how the events get paired together in the collective memory. Christina I have seen giant fields of solar panels while traveling through the Czech Republic. I found myself wondering how much juice they got out of those giant fields. Had to be more than a bit. But probably a pretty big initial expense. I think another problem is few people want the panels or unsightly wind turbines near them. Of course you could say the same for coal plants as well. Can clean energy technology compete? I kind of agree with Richard, it would be great to be on clean energy but I don’t know if the tech is there yet to get us off fossil fuels to any significant degree. I know at least Nissan has a new all-electric car coming out this year. But as far as I know the tech is not cheap enough yet to compete on its own merits (ie, without being subsidized). Just as important I’m not sure how much the market wants the product either, at least in its present limited form. I guess batteries need to get cheaper and more efficient yet. Another thing they want in our area are wind mills. Some areas are for them and some aren’t. The farmers want them the most for energy. In an article I read the Amish are really interested and got some Englishers interested. Wind technology is not that productive compared to other energy sources. You would have to cover the entire state of Maryland with windmills to create the same amount of power as one nuclear power plant. Nuclear power is clean and the rods could be re-used if allowed. France does it well because they standardize their plants and their jobs unlike the U.S. and we build all their plants. Here different companies build and manage plants and the jobs are not compatible from company to company. We could take one lesson from the French. It just makes sense. I think 75% of their power is nuclear at a much cheaper kwh than the average here. So they recycle blue doors from New Wilmington PA for chairs in Maryland?! That’s “clean” too! I had friends who installed two huge tracking solar panels that cost them $45 000 to install and they received $8 000 back from the government. It was a lot of money but still cheaper than what it would have cost to have power lines installed to their remote property. Depending on the cost and your usage it takes approximately ten years to recoup the cost and start enjoying free electricity. You can’t use appliances that produce heat such as stoves or breadmakers but it is a viable alternative to other systems. I really can’t see any country achieving that level of coverage in that time frame due to the cost of installation. I have talked to a several people over the last few years that live off grid. They have solar and or wind power. One couple that comes to mind said it took them 5 years to recoup their initial investment and they run everything in their home on the solar. Except their stove which is wood burning. They now sell their excess power to the local utility company. I do not know how much they make a year with it but they are happy. Their are tax incentives to go solar both on the state and federal levels. Wind power is doing a heck of a job at a wind farm here in central Illinois and will pay for itself in less than 10 years. If I had the funding, I would go solar and wind and get off the grid. Mainly becaue I would rather have that money going into my pocket. Utilities, like everything else keeps going up. I have seen that solar panels and installation has come down in price compared to when it was relatively a new thing. 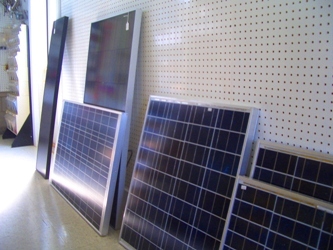 If you are handy you can buy the solar panel kits and install them yourself saving even more money. To me it is worth it. Do I think we could make it to 80% by 2035? That might be a stretch but I think we will see it increase quite a bit especially with the tax incentives in place. Also there is a movement in this country to the “homesteading” lifestyle and as more people move into that style of life they will look to alternative energy such as solar and wind. Ok, I will try a little math. Dont quote these figures. 🙂 But I think they are in the ball park. Solar panels used to cost about $5-6 per watt. At $5/watt initial costs (without inverters, framing, etc), a kilowatt panel would be $5,000. So in one hour on a sunny day you would get 1kw of power. From the electric company that is going to cost you about 10 cents. So divide $5,000 by 10 cents and you end up with 50,000 hours to pay it back. So if your panel runs 8 hours of sun a day (which it wont!) you end up 6250 days or 17 plus years. I have lived off-grid a number of years, used solar, generators, and candles, and the only reason people go solar is because of religious reasons like the Amish, environmental reasons, or simply no other options. At this point, the simple fact is that it really isnt a viable alternative to calling the electric company and hooking on to the grid. The Amish in Allen County, IN are big into solar, and one man told me there that a typical system costs between $10,000 to $15,000. The interior wiring of the house would cost basically the same either way, if you are talking of having power in all parts of the house. It boils down to this, you pay $15,000 now and get free electric for the next 20 years, or you pay the electric company bills over the next 20 years. A kW of electricity from the power company may cost 10 cents today, but there are two other things that your calculation does not take into account. One is that most power companies charge a monthly usage fee in addition to billing for electricity used, even if you don’t use any. If you are a low user (like me), this fee can be more than the amount of electricity you are charged for. The other is that electricity costs (at least here) are going up fast. We had a 10% jump this year, and hydro use is now taxed. With solar or wind you have at least locked in your costs. Grid power will probably continue to rise in price faster than inflation due to higher fuel costs and the fact that most grids are badly in need of repairs. The power companies have been putting them off for years, but at some point, they will have to fix them or risk brownouts and blackouts. The costs will of course be passed on to the consumer. Just my 2 cents on why solar might make some sense. the electricty for any electric will come from a fossil fuel power plant. 80% by 2035? never happen. correction: electricty for any electric CAR will ……. Several months ago I watched a news show where an individual unplugged all appliances not in use. I had already started doing that with some appliances. So many continue to use electricity when not in use. I also bought a wind up alarm clock, but to my dismay wound it too tight one night and it didn’t go off in the am. When I checked it, it unwound so quickly my finger was cut. I hope to take it apart and see if I can fix the spring, or buy a new one at the cost of almost one months elec. bill. One thing I find frustrating on some appliances is when plugging back in, they have to be reset again. Now I plan to check those things out before purchasing an appliance. Leave a reply to Amish lead the way to a “clean energy” future?